In 1987 the Morley family, then owners of Keyham Farm, were looking for a new farm project. 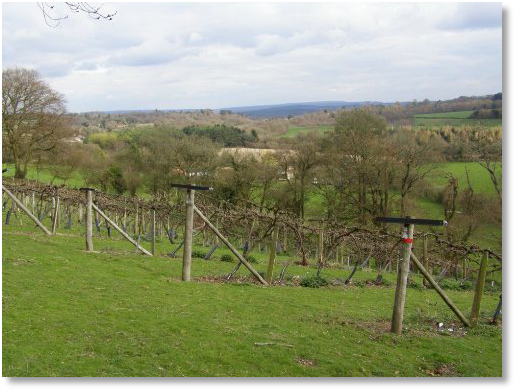 Their friend Neil Elkins, newly retired chartered engineer and wine-lover, also wanted a new occupation, and at his suggestion a partnership was formed to start a vineyard, with the aim of producing high quality wine. The site was chosen, and in 1988 the first vines were planted. In 1994 the farm itself was sold, but the partners could not bear to lose the vineyard and decided to run it as a separate enterprise. The varieties grown are Bacchus, Madeleine Angevine, and Seyval Blanc which have all been proved to produce excellent white wine under English conditions. The varieties are not planted in blocks as is more usual, instead the rows, each of one variety, are planted in sequence (A-B-C). This means they are evenly distributed throughout the vineyard and also aids pollination. The vines are on a high-training system enabling the grapes to form at the top which exposes them to sunlight, and helps the air circulation, thus reducing mildew. They are also above the frost, and beyond the reach of badgers who are very partial to grapes! From the beginning our policy has been to provide our winemaker with top quality grapes rather than go for high volume production, so the vines are trained and pruned to produce a relatively small amount of fruit but all of top quality. The harvest is delayed as long as possible, so although some grapes may be lost to birds and botrytis, the rest have increased sugar levels and lower acidity, and as the vineyard is a quarter of a mile from any road they are as pollution free as possible. 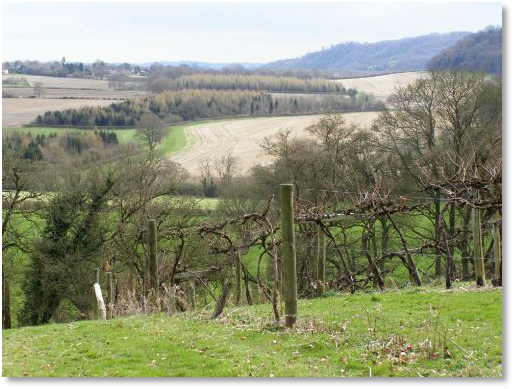 Set high in the lovely Hampshire countryside, with a superb view over three counties, this must be a strong contender for the most beautiful vineyard in England. The site is about 1.5 acres in size, and is ideal for white wine production. The steep south slope catches the sun, and the surrounding trees give shelter from north and east winds. However the vineyard is 500 feet high at the top, too high for optimum heat levels, so red wine grapes would have difficulty ripening. The soil is light loam over chalk, not unlike that in Champagne, and therefore particularly suited to the production of fine white wines. It provides excellent drainage, and the vines can put their roots far down into the chalk so extracting the minerals which give the wine character and flavour.